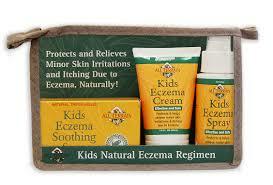 Natural Kids Eczema Soothing Soap Ingredients: Sodium Palmitate, Sodium Palm Kernelate, Water, Glycerin, Melia Azadirachta (Neem Seed Oil), Melaleuca Alternifolia (Tea Tree) Leaf Oil, Sodium Chloride, Sodium Gluconate, Glycine Soja, (Soybean Oil), Helianthus Annuus (sunflower) Seed Oil, Plantago Major (Plantain) Leaf Extract, Malia Azadirachta (Neem) Seed Extract, Avena Sativa (Oat) Kernel Extract, Iron Oxides (C177492, CI 77491). Rainforest Alliance Certified™ Palm Oil. Inactive Ingredients: Aqua (water), Capric /Caprylic Triglycerides, Zea Mays (Corn) Starch, Kaolin, Stearyl Alcohol, Glycearyl Stearate, Glycerin, Squalane, Zinc Oxide, Gluconolactone & Sodium Benzoate, Xanthan Gum, Allantoin, Aloe Barbadensis Leaf Extract, Citric Acid, Butyrospermum Parkii (Shea) Butter, Potassium Sorbate, Alpha Bisabolol, Essential Oil of Eucalyptus Globulus and Melaleuca Alternifolia (Tea Tree), Neem (Azadirachta indica) Oil. Other Ingredients: Aqua (water), Capric / Caprylic Triglycerides, Squalane, Kaolin, Zea Mays (Corn) Starch, Glycerin, Zinc Oxide, Gluconolactone & Sodium Benzoate, Aloe Barbadensis Leaf Extract, Stearyl Alcohol, Allantoin, Butyrospermum Parkii (Shea) Butter, Glyceryl Stearate, Potassium Sorbate, Alpha Bisabolol, Essential Oil of Eucalyptus Globulus, Melaleuca Alternifolia (Tea Tree), Citric Acid, Neem (Azadirachta indica) Oil and Xanthan Gum.